How about a quick, fun idea? An idea so easy you can do it today! All you need is a banana, an ink pen and a little imagination..
We recently had a party with the movie, Despicable Me as the theme. 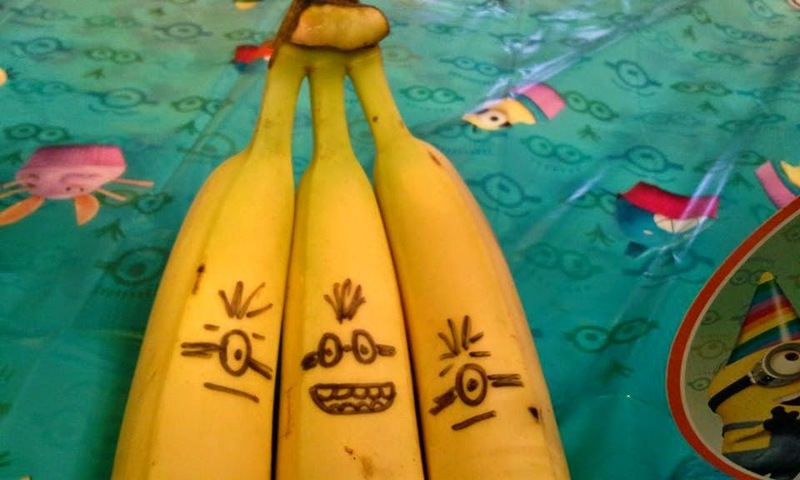 Below are some bananas that became “minion” guests at the party. As “minion” ideas swirled in my head, new ideas evolved as well. There are other things you can do with this technique in mind. You can write any message on the banana, draw a heart or smiley face, or add an “x” and “o” for hugs and kisses. If you want your message to be secret, evolving after a few hours (for packed lunches); write your message on the outside of the banana peeling with the non-pointed end of a wooden skewer or other like object. As the day progresses, your message will appear on the banana peeling! Why? You are essentially bruising the banana and it will become dark with time. This can be done for your children, spouse, added to a care package for a friend or relative, etc. This type of activity is sure to bring a smile to your loved ones face as it warms their heart from your taking the time to think of them. Sharing special moments, creating fond memories, does not have to take a lot of time, effort or money. Small acts of kindness produce long remembered big results. Who can you make smile today?